Martin Storey and Sarah Hatton are legendary for their luxurious textured designs using Rowan Yarn. In this collection of 22 patterns for men and women, they have outdone themselves with head-turning sweaters, hats, and scarves. Sarah designed the 11 "Knits for Her," which include a sloppy joe, aran coat, and twisted cable sweater. Martin’s 11 stylish designs for men include a textured sweater, neat tailored jacket, and herringbone cardigan. 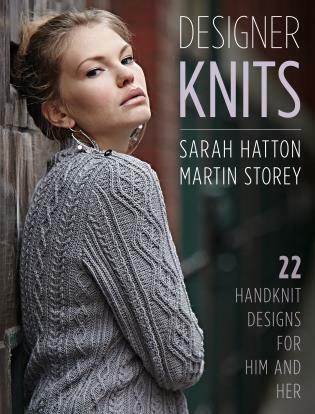 Sarah Hatton is a well-known designer and author of numerous knitting books, including The Knit Generation, Knitted Scarves & Shrugs, and the Sarah Hatton Knits series. Martin Storey designed for the prestigious knit design company Artwork in London for many years, and then became one of Rowan Yarns’ top designers. He is particularly known for his brilliant colorwork and textured knit designs. He is the author of books including Easy Fair Isle Knitting, Scottish Knits,Aran Knits, and Knits for Him.